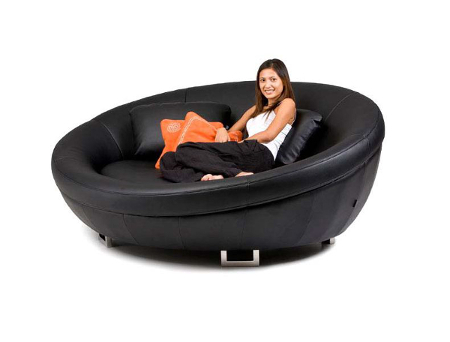 THE UFO ROUND LOUNGE SOFA WITH FABRIC or LEATHER COVERING, SOLID WOODEN LEGS WITH DARK BROWN FINISH (FABRIC) or METAL LEGS (LEATHER) AND COMES WITH 3 TOSS PILLOWS IN MATCHING COLOR. Exceptional design that will elevate any home interior. Perfect for the home entertainment room or for curling up with your friends and loved ones.